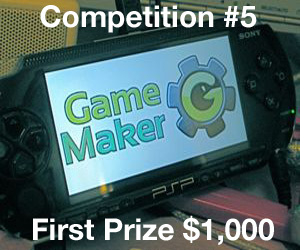 YoYo Games have announced their fifth Game Maker competition with $1750 of cash prizes. The theme, “Design A HandHeld Game“, is bound to reignite speculation of Game Maker games running on such devices in the future. A full list of game limitations are listed at the glog, the main limitations being a maximum 480 x 272 screen resolution and that controls are limited to the cursor keys and spacebar. The deadline for entries is March 30th. He added that some “minor amendments” might be made to the competition specification in the first 24 hours. YoYo Games’ last Save the Planet themed contest ran from September 2008. I think it would be possible to upload a gm game to PSP, if the requirments match right. Other handhelds are not possible to play gm games(unless they added extenstions to Game Maker such as .nds depending on the memory). We are fond of Game Maker, as we in our team of programmers. It may be possible. if this is true then it will be soooooooooo cool. (I hope the gamemaker interface will be the same though as im only ten and i can just about grasp gm8). I want someone to make a really hard game with physics, alpha-transparency and a secret DLL. Brad :GM Cannot be developed for the iPhone. Apple does not allow applications to “interpret” other code (GML in this case) because they verify every application, and they are unable to verify interpreted games. Actually, Apple are starting to open up the market to other forms of game creation. You need only look to Flash CS5, where games are built in AS3 yet compiled as iPhone app files. Certainly, they still restrict the release of the Flash plugin, but what we can see from here is that Apple don’t necessarily want to stop other development tools, rather they want to direct them into the iPhone marketplace through the use of a dedicated format. I don’t profess to understand the technology behind it at all, but perhaps Sandy has an iPhone compiler under his hat? I’m very interested to see where YYG takes the whole hand-held thing. Not sure I like the fixed resolution…never tried anything under 800*600, so this will be new to me. Single key and arrows should be fun to work with. At least it’s less restrictive than the Kokomori single button competition! @Brad Yes and no. The Apple iPhone SDK does prevent GM from being considered in its current form, but all that is really needed is a runner that has been limited to fit the restrictions of the SDK. That means no more dynamic objects, timelines, or triggers; no more execute_string or execute_file; no execute_program or execute_shell; no more anything that can add code to a game. Most games wouldn’t be affected by those changes. 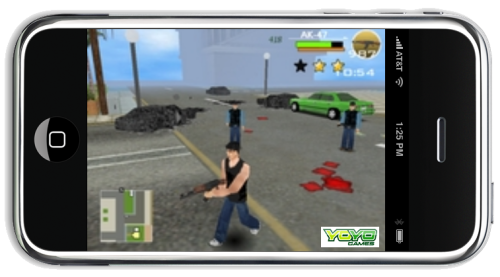 The current SDK restrictions also mean that YoYo Games Instant Play will never appear on iPhone. Well if you have to upload the game to YYG.com, then I’m pretty sure that they’d notice this “secret DLL” you speak of. I do think that GM should be ported to more platforms that it already is, but there is always restrictions – like with the DS, you would lose a lot of functions. And I mean, how many people actually own a Zune HD? I’ve never seen one. iPod Touch & iPhone, seen to many. I’d pay the $99 in a heartbeat. Sure as heck beats Microsofts XNA Developer fees for publishing for the XBOX. I’m looking forward to this comp, hopefully I can think of something to enter. GM Cannot be developed for the iPhone. Apple does not allow applications to “interpret” other code (GML in this case) because they verify every application, and they are unable to verify interpreted games. Also, it costs $99 to start selling iPhone applications, which I don’t think most developers would be too happy with. @Philip Gamble I had forgotten Sandy worked on the X-Box team; he probably has knowledge of XNA dev after all then. I’ve got one of the old Zune’s, not the new HD. I really like the platform though, and the fact that you can develop a game for PC then immediately port it to the X-Box and Zune with a few clicks makes the .NET and XNA framework very appealing as a game development platform. I would expect them to go after something that has a larger market share, however (like you said, this makes me think iPhone). @Sam Whited Zune was my immediate thought when I first saw the initial announcement given the screen resolution and Sandy’s years at Microsoft. Not that I have ever actually seen a Zune though, I think you have one??? The rules are a bit ambiguous. And I don’t like things being ambiguous. However, I’m excited about Sandy’s claim that he will be able to play a game on a handheld, presumably through porting. If I can get enough motivation, I’m in. 480Ã—272 is the size of the latest Zune and also the PSP? @Brad: If I could make games for the iPhone, and had a game I felt was pretty well made, I think I would pay the $99. I’d only need 100 sales (assuming I sold it at $0.99) to make it back. Anyways, I’m excited about this competition. I’ll definitely enter, if I have an idea that’s suitable.